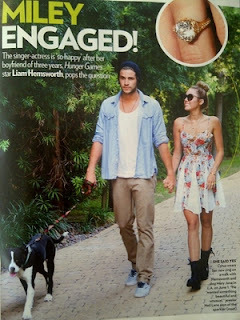 19-year-old Miley Cyrus and 22-year-old Liam Hemsworth are officially engaged. But how does her father Billy Ray feel about the proposal? According to a friend of the Cyrus family, Miley and Liam had to do a little convincing before Billy Ray gave the couple his blessing. Billy Ray didn't want "The Last Song" stars to take things too quickly. Liam reportedly talked with Miley's father about the proposal and said marriage is something him and Miley take very seriously. Hemsworth has been in Miley's life since 2009 after meeting on the set of "The Last Song" and the lovebirds have been together since. There is no set date for the wedding and some reports are saying the two want a long engagement. The ring was a 3.5-carat diamond ring designed by Neil Lane and cost around $250,000. Nice choice.